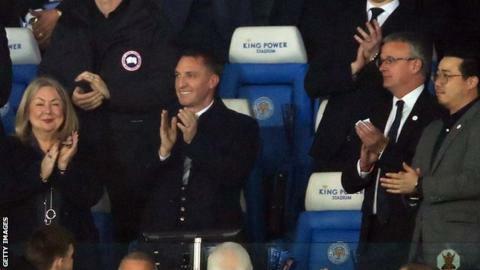 Brendan Rodgers has said he had perhaps taken Celtic "as far as I could" as the manager completed his move to Leicester City. The 46-year-old Northern Irishman has signed a contract until June 2022 with the English Premier League club. Rodgers said the move "had come very quickly over the last few days". "I was certainly in no hurry to leave Celtic. Celtic is a huge club - a worldwide renowned club," he told Leicester City TV. Rodgers had won seven consecutive domestic trophies since joining the Glasgow club in 2016 and, having already retained the Scottish League Cup, was on course to complete a third treble in a row. "I loved working with the players there and we were on a journey of great success over the last three years," he said. "But, when the opportunity came to talk to Leicester and I was able to analyse it, it allowed me to probably think that I had achieved and taken the club as far as I could at this moment." Moving to King Power Stadium along with Rodgers are assistant manager Chris Davies, first-team coach Kolo Toure and fitness coach Glen Driscoll. Celtic have moved swiftly to appoint former manager Neil Lennon in his compatriot's place until the summer, with coaches John Kennedy and Damien Duff moving up the pecking order to assist him. Rodgers, who leaves Celtic as they lead the Scottish Premiership by eight points, was appointed as successor to Claude Puel, who was sacked on Sunday. Before the new boss took his place in the stand on Tuesday as Leicester beat Brighton & Hove Albion 2-1 to move up to 11th place in the table, he said there were a number of factors contributing to his decision. As well as feeling he reached a ceiling at Celtic, he had been impressed with Leicester's ambitions to "grow the club and the training facility". "And the big attraction for me is working with the players," he said. "It's a young squad, a very dynamic squad that's got great potential and you've got some players with real experience too." Rodgers will now take charge of the squad ahead of Sunday's trip to face Watford. "I know I'm joining a fantastic club that's grown so quickly over these last few years and I'm just delighted to be here," he added.